I have the privilege of speaking about NEI's alignment activities on social media at the 2014 U.S. Women in Nuclear Conference this Tuesday. I'll be joined on the Social Media in Action panel by Curtis Roberts of AREVA, Suzy Hobbs Baker of PopAtomic Studios and Paul Harwood of Twitter, with Susan Downs of PPL Susquehanna serving as moderator. We are just a handful of the communicators in the nuclear energy industry who recognize the necessity and value of engaging with stakeholders through social media. The web has evolved into a social space where platforms such as Twitter, Facebook and YouTube allow multidirectional, unfettered conversations to occur across physical boundaries and social constructs. As a result, the marketplace of ideas has never been easier to access. With increased access, of course, comes increased volume. The noise on social is at full blast, with endless opinions and updates being lobbed at us from every corner. Smartphones are within reach at all times as new channels for sharing words, photos and videos pop up each day. Despite the overwhelming growth and clutter, social remains a space where real discussions happen, where minds and hearts are won, where everyday folks are moved to the point of action. It is a space where we must be active in order to reach our stakeholders and inform and persuade them on the benefits of nuclear. NEI's Social Media Digest: An email is distributed every Monday to social practitioners filled with content and best practices for Twitter and Facebook. The digest includes an overview of upcoming industry events and the latest news in digital media. Training NEI employees on Twitter: Internal experts like Ted Jones serve as advocates on Twitter, giving credible input to online debates around top issues. Lipman: with pro-nuclear US trade policies, US nuclear suppliers can compete on global tenders and win. Storytelling: We want nuclear communicators to persuade with less logos and more pathos. This means showcasing more of the human side of the nuclear industry. Hashjacking: We let communicators know which tags are popular and when to use them in order to join the conversation stream, such as on Earth Day and during live chats like the White House Climate Chat. 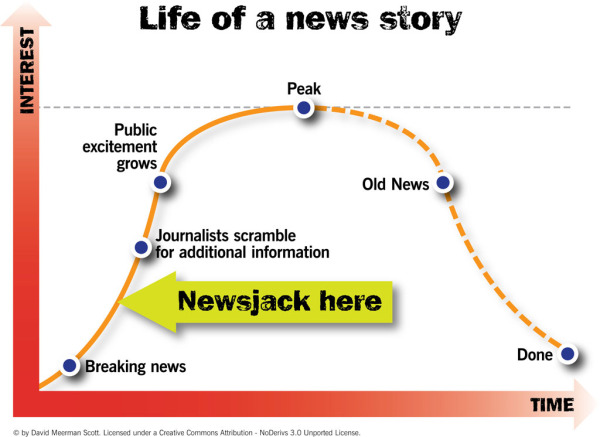 Newsjacking: This involves capitalizing on the popularity of a news story to amplify our messaging. We alert members to upcoming events and news items, and prompt them to place messaging on social before interest peaks. NEI has successfully done this ahead of the release of Pandora's Promise and the premiere of Years of Living Dangerously. Follow along with the social panel and entire WIN conference using the tag #USWIN2014. Find my tweets at @taryou, and introduce yourself if you will be in the crowd. Ducks may fly together, but duck formations can be excellent target practice for hunters. Soaring, independent birds of prey can be more successful at picking off targets of opportunity and also by inspiring those who observe the graceful flight and aggressive attacks. Good luck with your strategy. In the multifaceted online world there are many available paths to achieve a goal. There are also a variety of independent thinkers who prefer not to fly in formation or march in step. True enough. Agree there are many avenues to get to the goal, and I think our members use a variety depending on the situation. Thanks for your feedback, Rod!